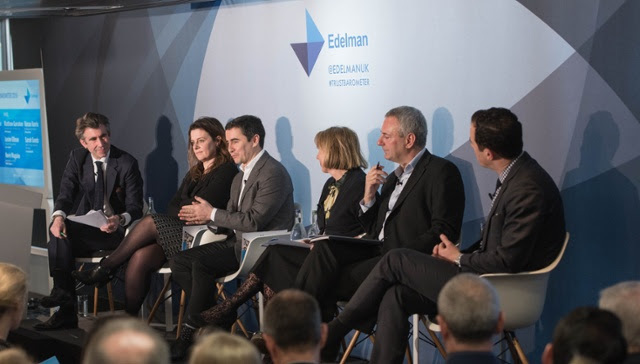 I attended Edelman’s launch of their annual global study this week. Each year they release an executive summary that looks at public trust in institutions. The verdict: public trust across all institutions is at an all-time low. In 2018, we have a battle for truth and trust. Business, media, government, and NGOs are all affected – however, interestingly, for the first time business (and its business leaders) are at a higher position than NGOs in terms of trustworthiness. Fortunate the launch was not held on blue Monday, I thought. Still, in the January drizzle, the findings themselves remained a little difficult to digest. What can be done by this lack of trust? How can we in the business community set the right example? Richard Edelman spoke about this and alluded to the importance of Larry Fink’s newsletter to CEOs at this time. He called upon business to seize the opportunity to lead – and to take the responsibility to create long-term value for society. This is needed to narrow the trust gap – and to help restore the conditions needed for a democracy to work. The report makes some interesting observations, so I am sharing the top three findings that caught my eye. 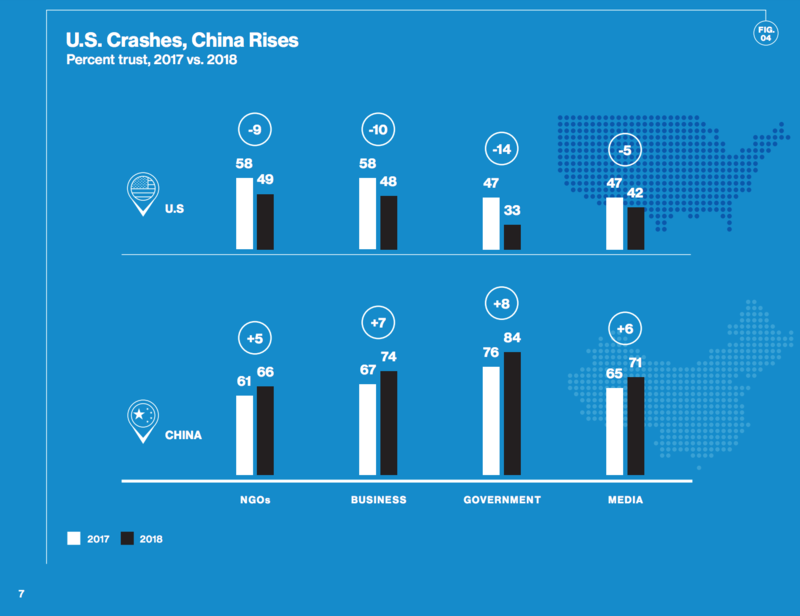 Trust across all US institutions plummeted in 2017 – the US dropped to the bottom of the country trust index in terms of the “informed public” category. The decline in trust for business was only beaten by trust in government. 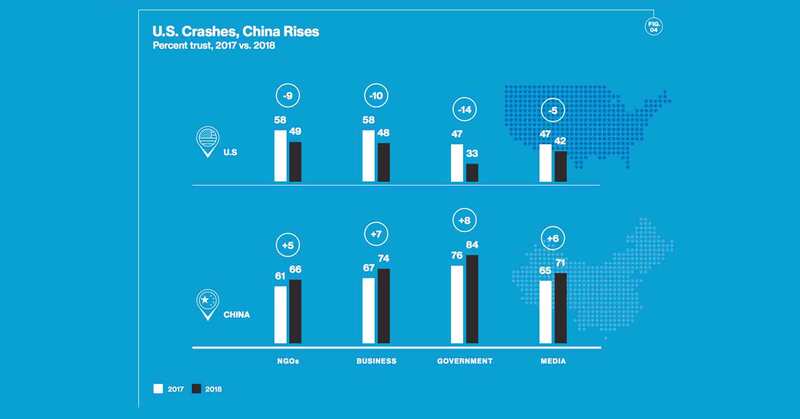 China, notably, leads the country trust index. Richard Edelman noted that although one might debate these absolute numbers, it is noteworthy to acknowledge the trend, or maybe even the shift, this represents. Graphic from Edelman Trust Barometer - page 7. 3. In the current media environment, Edelman talks about “the return of experts” and the challenges in the role of platforms like Facebook, Google and other tech companies. Expert voices are returning to a position of credibility. The list is led by technical and academic experts, and to a much lesser degree by journalists and government officials. In the panel, Google argued why they were “not in publishing, but just a platform” versus various media outlets like the BBC, Daily Mirror, FT and Buzzfeed arguing the opposite. Edelman’s remarks should inspire business leaders to speak up with more candor this year. Tech companies (and we’re one of them) need to take responsibility for their role in society – and decide what that means for them in terms of accountability and leadership. Rational, fact-based arguments are valuable currency, and I hope you will join me with the shared aim of reversing this concerning lack of public trust. What’s really clear is the opportunity for business leaders to lead and restore trust by proving credible information to the public: corporate transparency is the center-piece and we can all play a role in making sure that information gets out and is heard. What are you and your organisation doing to promote transparency this year? Leave a comment below!